Whether you’re a product engineer or a purchaser, you need to stay ahead of rapid industry changes as the demand for new and better product grows. Over the past 70 years, Catalus Corporation has transformed powder metallurgy into a cutting-edge process that goes beyond your expectations while anticipating your future needs and opportunities. Catalus has vast experience in tool design and development, compacting, sizing/coining, sintering and many secondary capabilities. As one of the nation’s only World-Class suppliers, we are able to construct complex parts you simply won’t find with other powder metallurgy manufacturers. With IATF-16949 certification and two state-of-the-art facilities - we offer modern, well-equipped tool rooms capable of maintenance, repairs and new tool construction. Some highlights of our tool room include 3D capabilities, simple stress analysis, Autodesk Inventor, Esprit, 2D AutoCad and rapid prototyping. Catalus features CMMs (both automated and manual), density scales, robotic vision systems, resonant inspection, data collection and gear measurement systems for all your powder metallurgy needs. 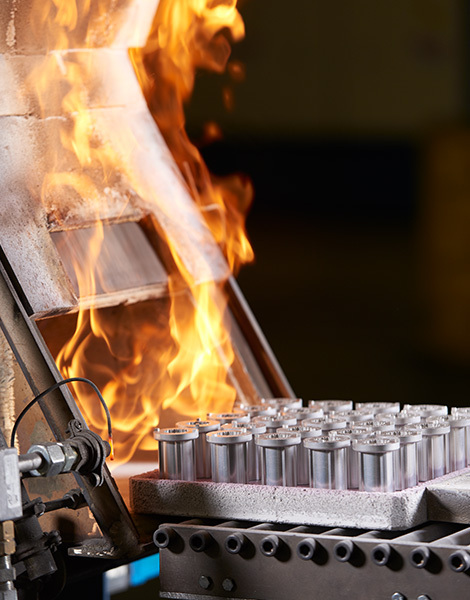 Our furnaces are equipped with atmosphere controlled sintering capabilities and can sinter up to 2400 degrees Fahrenheit. Proud to be environmentally friendly, we offer closed looped cooling systems, reducing the impact on the environment. We offer both in-house and outside secondary capabilities, including: vibratory finishing, rust inhibit dip, oil impregnation, assembly, sinter bonding andhoning. Outside capabilities range from drilling to machining, grinding, heat treatment,, high energy tumbling, assembly and many, many more. When it comes to compacting, we offer multiple multi-action presses, from 45 to 825 tons. Multiple presses ranging from 45 to 200 max tons are employed for sizing and coining jobs.